Save money and time with the Online Ohio LLC formation application. Our easy-to-use service helps you form your LLC directly online without the costly attorney fees. Pick a package, complete a comprehensive interview online, follow our step-by-step instructions, and leave the rest to us. We file your articles of organization with the Ohio Secretary of State for you and your LLC will come into existence the day they're filed. If you'd like to form an LLC in a state other than Ohio, click here to select your state. 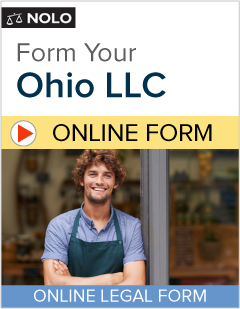 Form your Ohio LLC today! How do I form a Ohio LLC? How much will it cost to form my Ohio LLC? How long will it take to form my Ohio LLC? Will I have to pay taxes on my Ohio LLC? Do I need a lawyer to form an LLC in Ohio? The decision to form an LLC is an important one. Like a corporation, an LLC is meant to be a permanent legal entity, and it will exist—and incur taxes and fees, whether or not you are actively operating a business—until you take legal steps to dissolve it. How many people do I need to form a Ohio LLC? You can form a Ohio LLC with just one owner. However, corporate taxation is very different from the taxation of LLCs, and this can be a deciding factor in which type of business you form. For instance, if your business will hold property such as real estate that's likely to increase in value, an LLC may make more sense, because corporations and their shareholders are subject to a double tax (both the corporation and the shareholders are taxed) on the increased value of the property when the property is sold. On the other hand, corporate income tax rates start out low—15%—so having the corporation rather than the owners taxed on some of the income may make sense. In Ohio, you create an LLC by filing "articles of organization" with the Secretary of State's office and paying a filing fee. You'll also need an LLC operating agreement, though it doesn't need to be filed with the Secretary of State. Your operating agreement explicitly states the rights and responsibilities of the LLC owners. An operating agreement clarifies the business arrangement between the owners and governs how your LLC will be run. If you don't create a written operating agreement, the LLC laws of your state will govern the inner workings of your LLC. After your articles of organization filing are accepted by the Secretary of State and you have an operating agreement, your LLC is official, but you will still need to obtain the licenses and permits that all new businesses must have to operate. These may include a business license (sometimes also referred to as a "tax registration certificate"), a federal employer identification number, a seller's permit, or a zoning permit. Forming an LLC does not exempt you from any of these requirements that apply to all businesses. To begin creating your Ohio LLC, visit the Online Ohio LLC page at the Nolo website. The price of Nolo's Online Ohio LLC formation service varies depending on your needs. Nolo's Basic Service. The price starts as low as $99.00 for Nolo's Basic Service, which includes a customized operating agreement and preparation of the articles of organization. Processing time can take two to three weeks. Nolo's Express Premiere Service. For all of these items plus Priority Rush Filing, a personalized LLC records book, membership certificates, an LLC seal, and preparation of the IRS application for a tax ID (Form SS-4), choose Nolo's Express Premiere Service for $299.00. With Priority Rush Filing, Nolo will submit your articles of organization to the Secretary of the State within one business day and you'll receive your final LLC documents three to seven business days later. Note that filing fees charged by the state are not included in our package prices. The Secretary of State charges $99.00. This filing fee will be added to your total when you check out. To compare Nolo's Ohio LLC packages, see the package and pricing details. If you order the Basic package, we will file your paperwork with the Ohio Secretary of State within four to five business days and you'll receive your completed LLC documents one to two weeks later. If you order the Express Premiere package, we will file your paperwork with the Ohio Secretary of State within one business day. You’ll receive your completed LLC documents by email three to seven business days later. You'll receive your LLC records kit directly from the manufacturer. While Nolo will make all efforts to expedite your articles of organization, the Ohio Secretary of State does experience fluctuations in processing times, so turnaround times may vary. State taxes. Visit the Ohio Department of Taxation's website at http://www.tax.ohio.gov/business.aspx to learn about LLC taxes in Ohio. You may also find it helpful to read Nolo's article on Ohio's LLC Annual Filing Requirements. Self-employment taxes. LLC members (owners) who are active in the business will probably have to pay self-employment taxes on their share of LLC profits—just as partners in a partnership do. You can form your own LLC online by using Nolo's Online Ohio LLC. We will walk you through the information needed to form an LLC. If you have a complex question, you may want to consult a business lawyer or tax expert. Our website features an online lawyer directory as a free resource to our customers. Comprehensive profiles of business attorneys in your state can be found at www.nolo.com. You can form an LLC in Ohio even if your business will not be located in Ohio and/or no LLC members will live there. But you will probably still need to qualify your LLC to do business in your home state—and this means you'll have to file additional paperwork and pay additional fees. For more information on whether you'll need to qualify to do business in certain states, read Nolo's article Qualifying to Do Business Outside Your State on Nolo's website. Note that if you don't register to do business in another state when required, you won't be able to enforce contracts in that state. Also, be ready for some state tax complications if you form your LLC in a state that's different from the state where all of its members live. For one thing, the LLC members might have to pay personal income taxes in the other state on LLC income. (At best, you might get credit for those taxes in your home state and not have to pay twice. At worst, you might have to pay taxes you wouldn't have had to pay at home.) Other state taxes vary from state to state, and might influence your choice of location for an LLC. An LLC—like any business—has to pay franchise taxes, sales and use taxes, other transaction and excise taxes, and employment, property, and transfer taxes. An LLC member who is active in the business—like a partner in a partnership—has to pay self-employment taxes on his or her share of LLC profits. You can deduct half of what you pay for self-employment taxes as a business expense. Members in manager-managed LLCs may not have to pay self-employment taxes if they are not active in the business. The self-employment tax situation for LLC members has been a subject of controversy and temporary regulations, and the dust has not yet settled around many of the issues. If you plan to be an inactive member of an LLC and don't plan on paying self-employment taxes, get an opinion from a local tax expert—preferably one who is willing to argue his or her opinion to IRS officials, if it comes to that. Securities exemptions may be an area where you'd like to get the opinion of a professional. If so, Nolo can help connect you with a lawyer. Nolo's Lawyer Directory provides a comprehensive profile for each lawyer listed, including the lawyer's experience, education, fees, and general philosophy of practicing law. Profiles of business attorneys in your state can be found at http://www.nolo.com. Like a corporation, an LLC is meant to be a permanent legal entity, and it will exist—and incur taxes and fees, whether or not you are actively operating a business—until you take legal steps to dissolve it. If you decide to discontinue business as an LLC, you must file a certificate of cancellation or dissolution with the Secretary of State. For specifics, contact the Secretary of State. Your articles of organization will be generated and filed with the Secretary of State. Turnaround times vary according to the package you choose. As soon as your filing is complete, we will email you your final LLC documents, including your customized operating agreement and instructions on a few more steps you need to take, including holding an initial meeting of your members or managers. After completing your purchase, you may no longer go back and change your answers because your order is being processed. You may, however, view your answers by signing in to your Nolo account at www.nolo.com/products/customer/account/login, clicking on My Account, and clicking on Ohio LLC.